PCs are at the core of Cleo & Nacho Design business mission. We are committed to helping our customers get the kinds of practical value, convenience and enjoyment they are looking for from their home computer systems, while avoiding as much of the pain as possible. So many choices, so little time� Cleo & Nacho Design can help you determine the best type of PC to fit your needs and budget, and provide the best sources for acquiring it. Cleo & Nacho Design can even procure or build the system for you if appropriate (as in the case of Custom/High-performance PCs). When the system is ready, Cleo & Nacho Design can install and configure the PC, and connect it to your network and/or Internet access. PCs are complex and when things go wrong they can become beasts. Cleo & Nacho Design's experienced technicians are adept at quickly figuring out PC problems, and in many cases fixing them right on the spot. In cases where hardware has broken down, Cleo & Nacho Design can determine your best options for getting the system back up and running, and provide replacement parts. In the process of troubleshooting, it can also be opportune to upgrade at the same time, to improve performance, storage capacity or functionality. Hardware installations can be intimidating even for people who are computer-savvy. Whether you're adding a scanner, a bigger disk drive, more RAM, or any number of other hardware upgrades (or replacements), Cleo & Nacho Design can help in a number of ways. We can provide the best recommendations for achieving your goals, the best brands and most cost-effective sources from which to obtain parts. Cleo & Nacho Design can also provide parts directly, and install them for you, while guaranteeing that things will work when it's all put back together. With Cleo & Nacho Design, you'll always get "plug and play" rather than "plug and pray"! Unfortunately, just like with hardware, software installation can be perilous and is often tedious, such as when upgrading your computer operating system. Cleo & Nacho Design will make any software installation or upgrade painless for you by making sure things are set up right. Our technicians know where all the updated drivers are, and they know the things that software manufacturers don't tell you in the manuals, such as how different software packages and options effect each other, degrade performance, etc. C&N Design is adept at building PCs that have specific performance objectives. Whether you need a killer game PC or a Home Theater PC (HTPC) that can provide better video output than most DVD players, Cleo & Nacho Design can help you, either directly or by providing referrals to one of our custom PC providers. 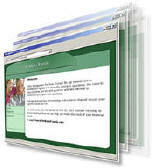 Let us provide professional PC services in your home at a convenient time for you.